I finally got around to doing two things in my kitchen – cleaning out the refrigerator and going shopping for real food (not milk and cereal anymore). I found a little jar of cherry-cognac sauce that someone had given me as a gift. I had used it before on vanilla ice cream (yum), but looking on the label, it suggested using it on meats, such as pork. So, luckily, I had a lot of pork chops and thinking of something fruity to go along with the cherries, I found a recipe for cranberry-walnut taboulleh. 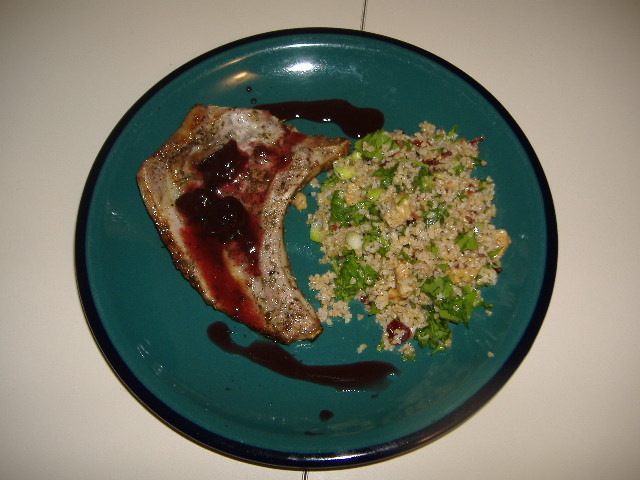 Overall, I liked how the sweet fruity flavors complimented the meat and the bulgur wheat. 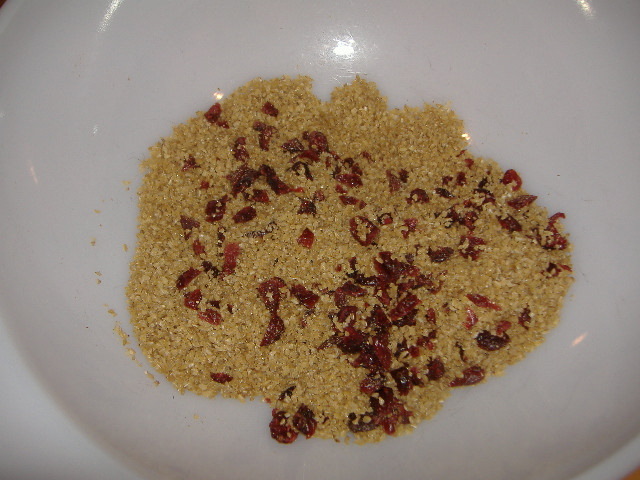 In a bowl, mix the bulgur, cranberries and boiling water. Let sit for 30 minutes. 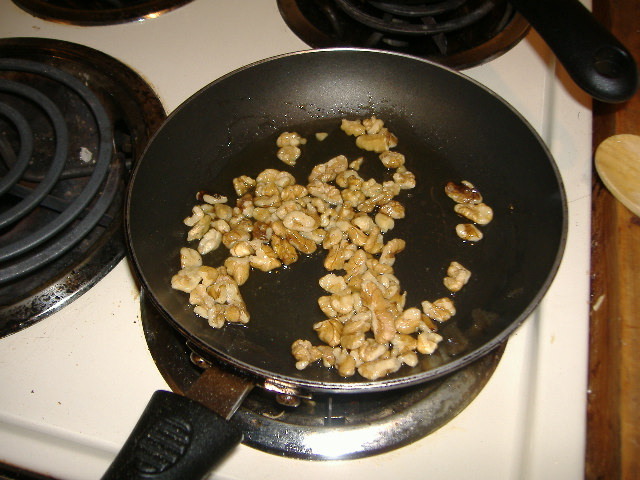 While this is soaking, add the olive oil to a skillet and roast the walnuts in the oil for several minutes – this is to release the flavor of the nuts and infuse the oil with walnut flavoring. After 30 minutes, add the remaining ingredients and toss. Can be served immediately or refrigerated. Season the pork chops with the herbs, salt and pepper. Place on a foil-lined baking sheet and spoon a Tbsp or so of the cherry-cognac sauce over them. Place baking sheet under the broiler. Broil for several minutes, until cooked about halfway through. Flip pork chops over, reseason and again spoon about a Tbsp on each chop. Continue to broil until completely cooked. But nevertheless, the tabbouleh was pretty good.